The Dyson Pure Cool air purifier uses mechanical air filtration to clean the air of pollen, dust and pet dander. This air cleaner has one pleated filter (HEPA) that has an efficiency rating of 99.97%. The filter also has a layer of a fabric type material with a thin layer of small pieces of activated carbon to help with light odors. The Pure Cool Link features a digital fan speed display (10 speeds), remote control and app. There are no controls on the air purifier itself so you have to use the remote or app. It also has a filter replacement indicator, sensor, and timer. Unlike other air cleaners, this has a swivel feature like fans have. As owners of an upright Dyson vacuum cleaner we were quite excited to get our hands on the Dyson air purifier. The first thing we noticed is the height. It is 40″ tall and has a diameter of 7.75″. This is taller than any other HEPA air purifier we have tested although does not feel so big since the base diameter is relatively small. For the purposes of this test we did not install the app as we were able to assess the performance with the use of the remote. The results of our testing were surprising. Read below to see the results. The Dyson air purifier is easy to set up and operate. It comes in a few parts in the box. We had some difficulty getting the top piece to snap into the base. This is because we installed the filter frame the wrong way and this was not obvious. After several minutes of trying to get them to snap together we turned around and then it easily snapped together. To operate you need to use the remote control or app. The power controls are intuitive and access to the filter was easy as well. The filter requires replacement every 6 months (24 hours per day). Dyson lists their CADR as 70. CADR stands for Clean Air Delivery Rate and represents the air flow of clean air from the air purifier. The higher the CADR the larger room size it can clean. This CADR is low compared to other high-end air purifiers we have tested. Dyson says the air purifier delivers 410 liters per second of air flow. Converting this to cfm (cubic feet per minute) we get 868 cfm. This is the highest we have seen for an air purifier. This is due to the AirMultiplier technology. Above is a video from James Dyson that explains how this works. Essentially, air is pulled through and around the top part where the air comes out of the air purifier to amplify the amount of air that is moved. On speed 10, we could feel a decent breeze at 15 feet away. We find the noise level to be low for an air cleaner with a HEPA air filter. While the air flow is extraordinary, we had some challenges with testing the filter efficiency. The filter efficiency results were different compared to other air purifiers so we did additional testing at 3 locations. 1. We tested the filter efficiency 1 foot in front of the air purifier where the air flow was highest. 2. Along the air blade (top part that is called the loop amplifier) where the air first comes out. 3. At the point where the air exits the filter. 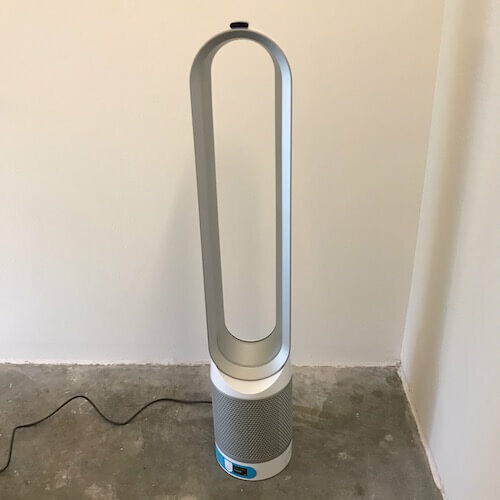 The Dyson air purifier runs without the loop amplifier (big top part) attached so we were able to test there. In fact, you can also run this air cleaner without the filter installed. At one foot in front of the air purifier we found 13% of the air to be filtered for the small particles (0.5 microns) at speeds 5 and 10. At the loop amplifier, we found 34% of the air filtered at speed 5 and 23% filtered at speed 10. Then we tested at the base. Here, speed 5 removed 55% of the small particles. Speed 10 removed 88%. Given that speed 10 was so much better, we re-tested at speed 5 and got 52% filtered which is similar to our initial test. We then tested at speed 1 and the efficiency was 25%. There is little air moving at speed 1. So, it seems that while the air flow is excellent, the way the AirMultiplier technology works is that as much as 16-18 times more air is pulled through the fan from the surrounding air. In other words, it seems that a good portion of the air flow is not through the HEPA filter. The filter efficiency numbers are low for a HEPA air cleaner. The other HEPA units we tested have efficiencies in the 90-100% range. This model did not compare well from a filter efficiency standpoint. On the web for customer reviews we found 60% of reviews gave the Dyson air purifier a 5 star rating and 77% gave a 4+ star rating overall. Many positive comments were given for the design, light weight and taking up a small amount of floor space. The key negatives that were reported is the frequent filter replacements and some issues with the app. Source for consumer reviews: See at Amazon.